After taking two weekends off in a row, The Lost Boys were at it again! 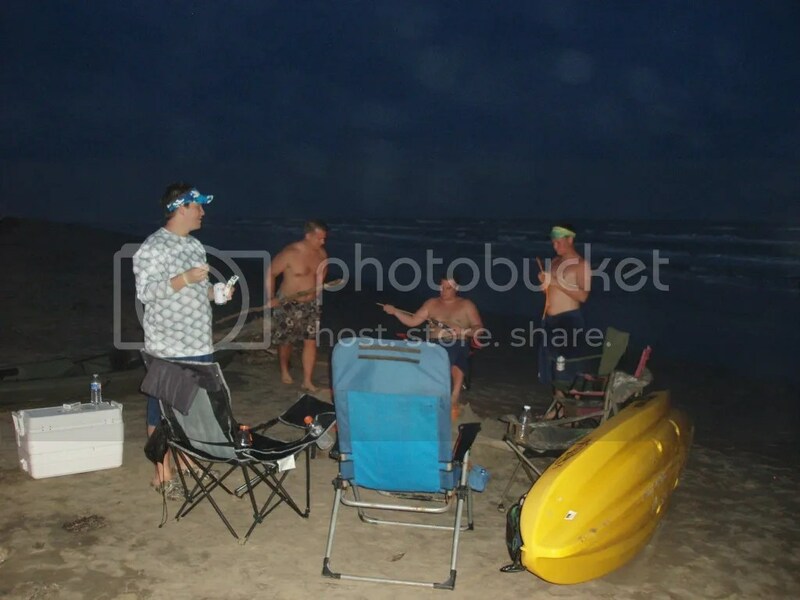 We decided to hit our normal stretch of beach with the plan to fish Friday and Saturday. We studied the weather and water conditions all week and the forecast didn’t look promising. Originally the water was supposed to be clean and flat, but as the weekend approached some bad weather rolled in. The waves were breaking at up to 6 feet and the water looked like chocolate milk, but the weather conditions were the least of our worries. 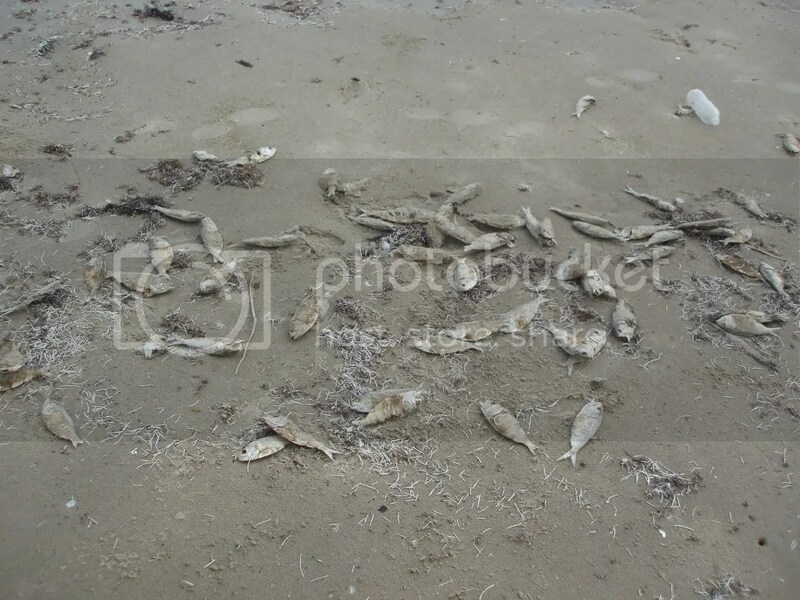 A red tide bloom had come through the weekend before and killed massive amounts of fish on the beach. 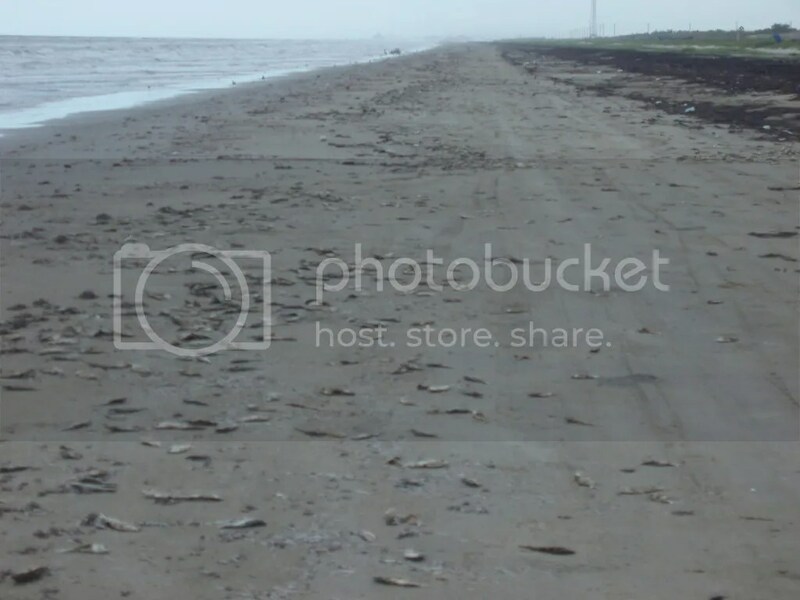 Red Tide is a naturally occurring toxic algae bloom that comes through occasionally in the later summer. It can kill fish, birds, and other animals. 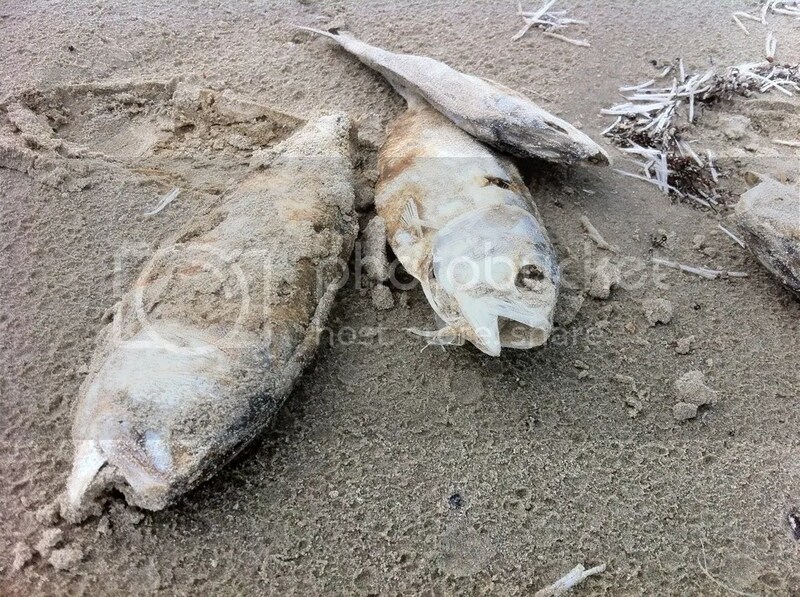 It will shut down beach fishing for the year. Luckily it was a light bloom that didn’t appear to stick around. However, we had come this far, so we were fishing no matter what. 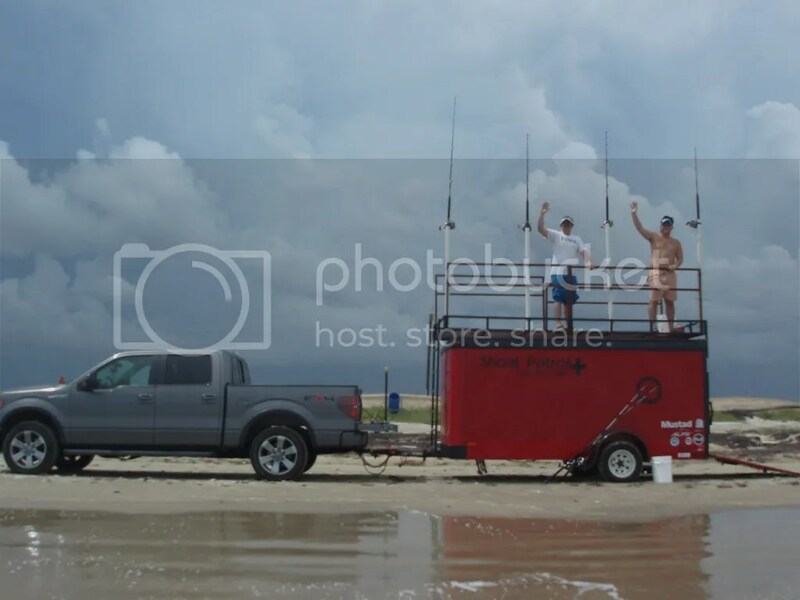 We arrived on the beach Friday and quickly set up the trailer, camp, and started catching bait. Fishing was rough from the start. We had the hardhead curse. We couldn’t catch anything except for those nasty catfish. Every once in a while we would pull in a small whiting, but nothing else. 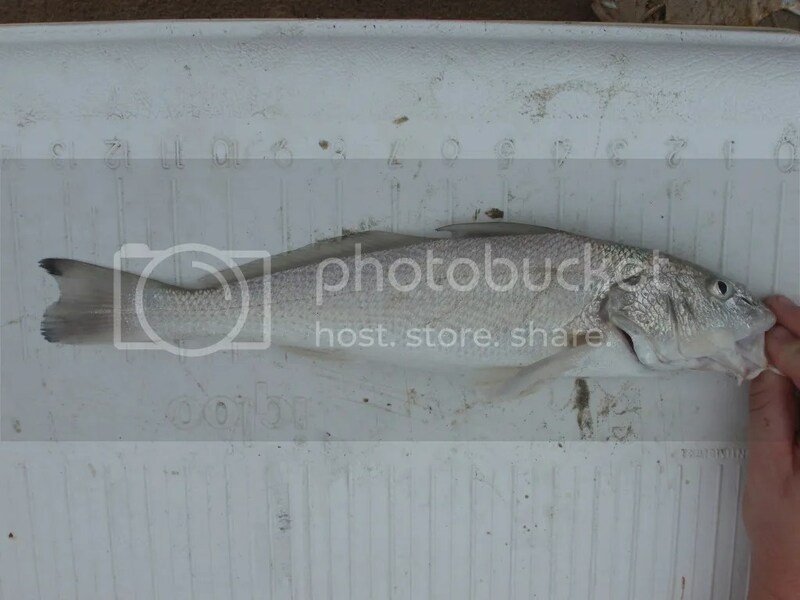 A nice big whiting for bait! After we were able to secure a few decent sized whiting, Justin decided to kayak out one on Josh’s rod. It was our only bait out, while we were putting fresh line on our other rods due to all the break-offs we had last trip. It sat for about 45 minutes and then took off with the strongest run that I had ever heard. It was lightning fast. We fish with a 40 foot sliding trace leader, so the shark won’t feel the weight until it has run 40 feet. Well, that 40 feet went in about 3 seconds. Then the shark paused for a split second, as expected, when it picked up the weight, but then it took off even faster. 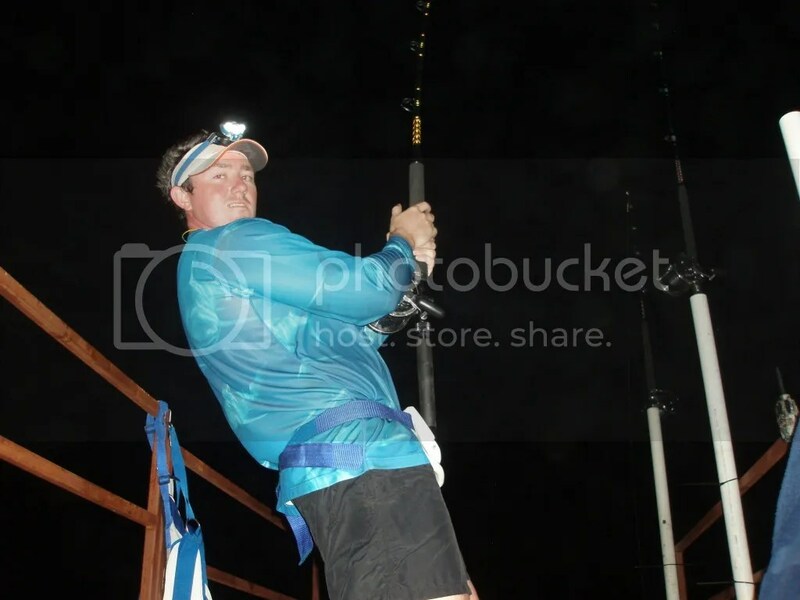 Josh grabbed the rod and started spinning the star drag to slow the fish down. He got the drag completely locked down and didn’t slow down the fish for a second. Then all of a sudden tragedy struck! The suddenly went limp. It had been cut. 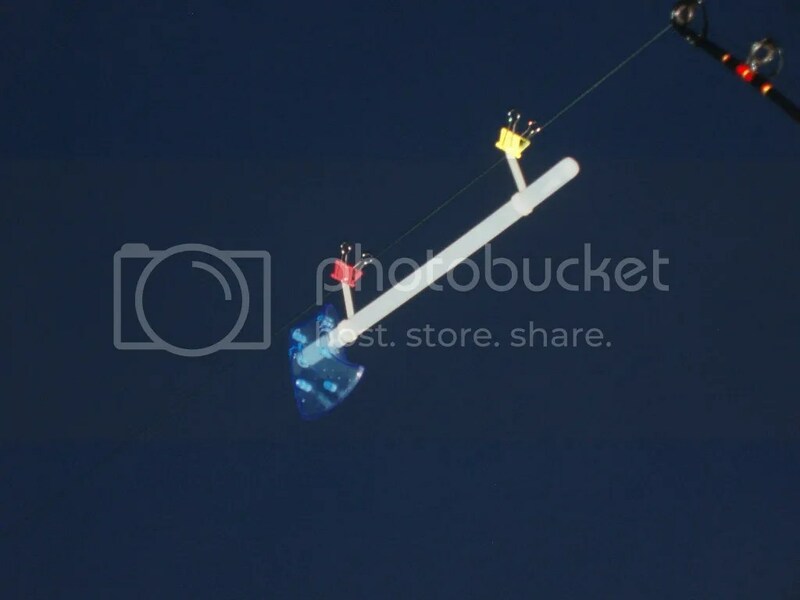 It wasn’t a pop, just a slack. We think there had either been a previous abrasion, or a mystery fish swam into the line and cut us off. FUUUUUUUU!!!!! It would have been nice to land that fish, but that screaming drag gave us a sudden wave of adrenaline. Justin and I began taking turns getting baits out, first, Justin with a stingray, then me with a whiting, and then Justin again…and again…and again. 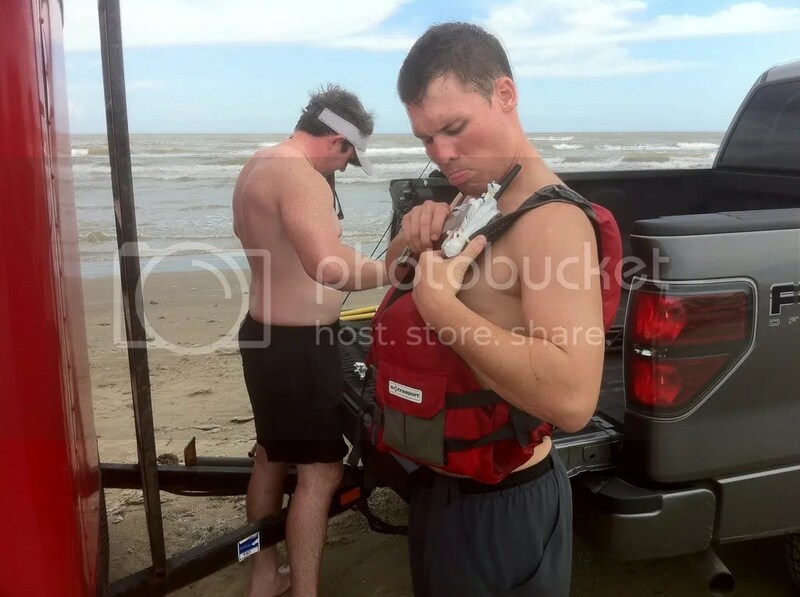 Justin is a kayaking machine. He will run a line out 400 yards through six foot breaking waves, get back to the beach, grab another line, and do it all again. I don’t know how he does it! The trailer is set up for the evening. You can see how bad the weather is in the background. An awesome glowstick we picked up from the dollar store. We also had green tridents. After the machine gun kayaking, we had 4 lines out with good baits on. Two bull whiting and two nice stingrays. We were feeling good for the night. Justin has a sixth sense when it comes to fishing. We gather around him at the beginning of every trip, like he is a witch doctor, and wait for his prediction. He was predicting a big shark for the night! 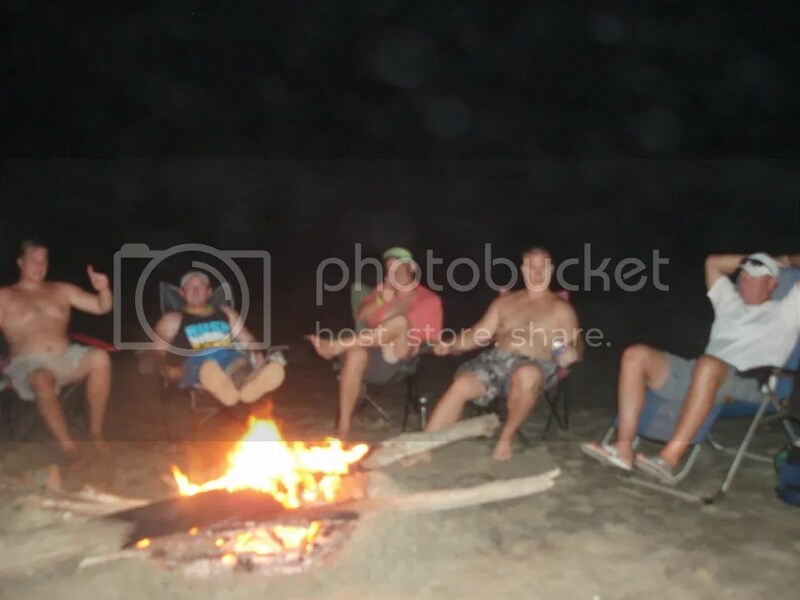 We started to settle into camp with some gas station burritos, Cheetos Puffs, a nice camp fire, and cold drinks when all of a sudden we see our lines drifting from right to left. It had to be seaweed! FUUUUUUUU! Oh well, we had a nice camp going and good company, so we decided to hang out for a while before we began the arduous task of bringing in the weeded out lines. After about an hour of camp life, we decided to pack it up and call it a night. 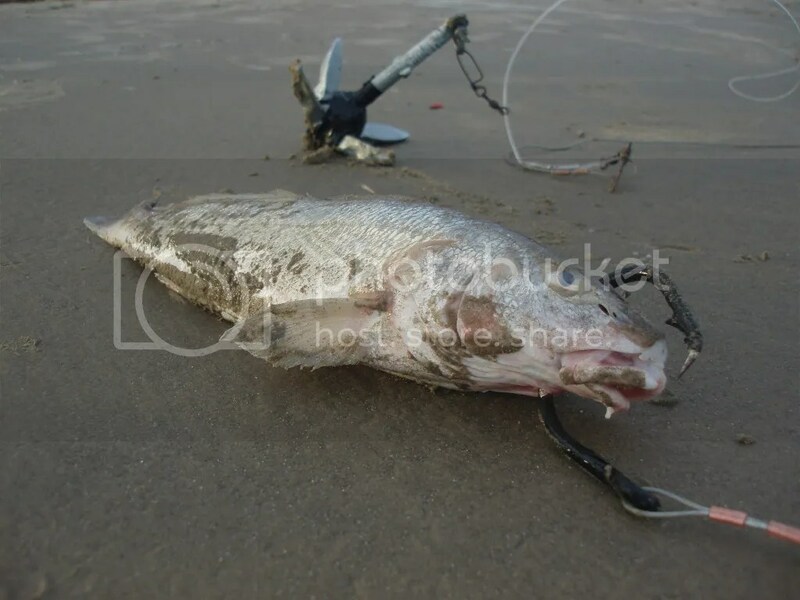 We started with my rod, which was swept out so badly that it was almost horizontal to the beach. As I’m finishing up bringing in my rod, Josh starts bringing in my other rod. About three minutes into Josh’s battle with the weed, his rod baited with a whole stingray takes off hard. We knew this couldn’t be seaweed. I picked up the rod and let whatever was on the other end eat for about 20 seconds and then locked down the drag. I felt nothing. No head shakes and nothing pulling. I was thinking that the fish must have missed the hook, so I set it back down and loosened the drag back. Moments later it took off again. Something was on, but it had to be a small shark. It wasn’t fighting at all. All Josh could feel was the weight of the seaweed on the line. 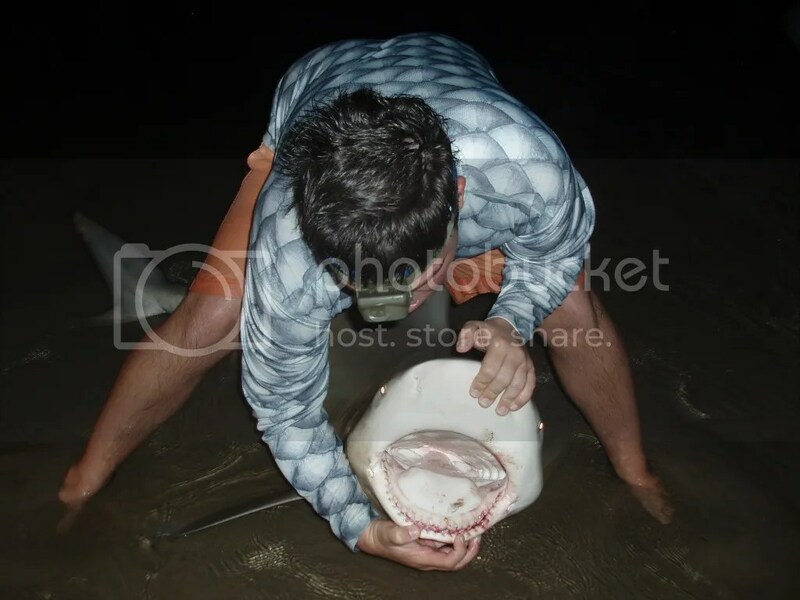 Justin, Craig and I took the release kit and waited in the water to unhook this pesky little shark. After about 20 minutes, the first thing I see is a giant ball of sargassum weed mixed with sauerkraut weed riding on top of the leader. Justin and I worked to get it all cleared, when we looked up and see a dorsal and tail fin bolting back and forth in the gut! Shark on! It was no pesky little shark either! It was a nice big bull! Justin and I quickly leadered the fish, pulled it on the beach, and got it unhooked while Craig snapped pictures the whole way. 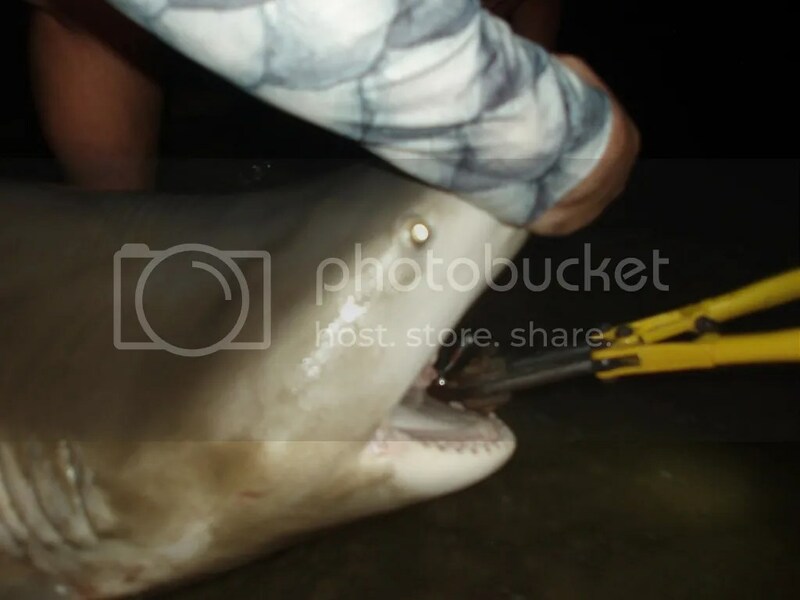 While we are pulling it up a fish starts squirming down the side of the shark. Justin shouted, “There’s a baby shark on it!” Hahaha! Oh Justin! It was a remora, but it gave us a really good laugh and Justin may never live it down. 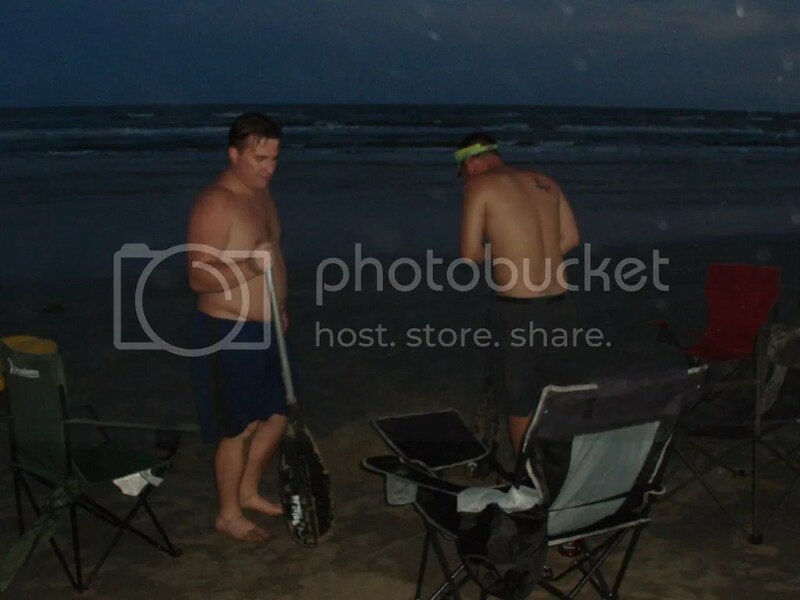 By the time we had it on the sand, Josh met us with the bolt cutters. We cut the hook and had the hook out in no time. The next step was to get a measurement. We look down at the tape…six feet eight inches and fat as can be. Holy Wow! 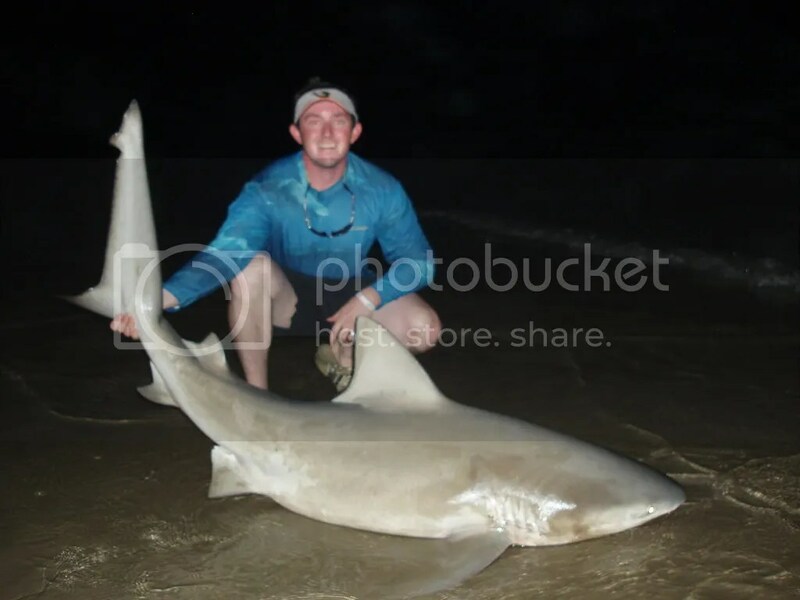 Our biggest bull shark yet! Unfortunately we didn’t break seven feet, but we were happy. 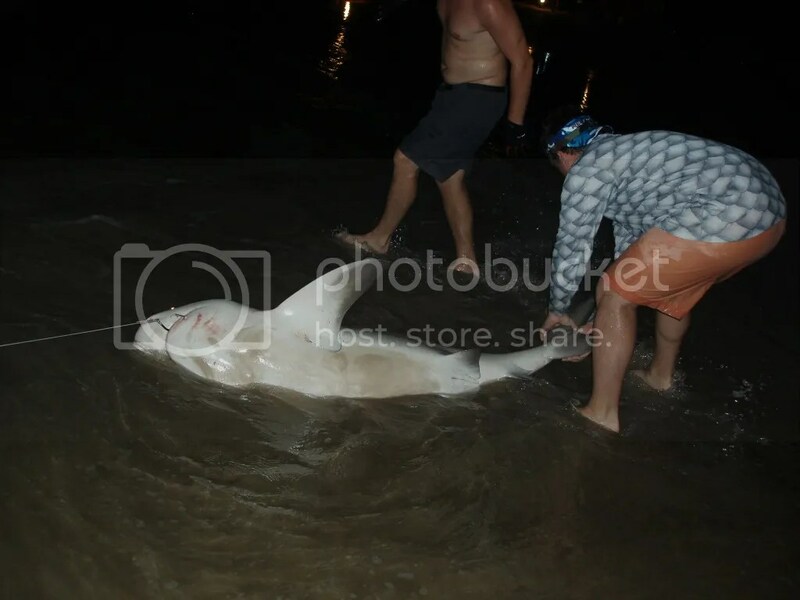 We get a few more quick pictures before the release the big male bull shark. He swam off nice and strong and couldn’t have been happier to get away from us. Josh with the trophy shot! In normal fashion, we celebrated with some warm Cold Duck! It was getting late by this point and we had no more lines out, so we decided to pack up the trailer and head back to the house for a good night sleep in a comfortable bed. The next day was fairly uneventful, so I will make the rest of this report short and sweet. 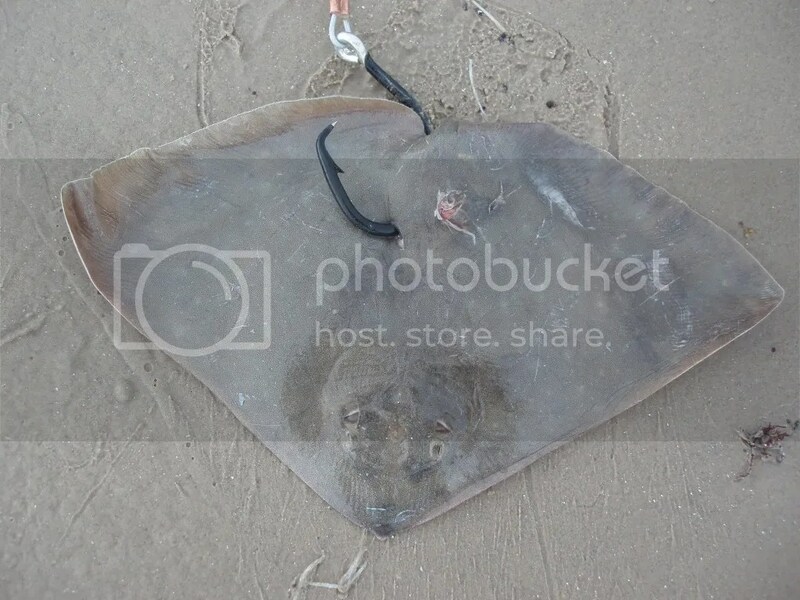 Tom joined us in the morning, and we got to the beach in the early afternoon and set up another variety of baits that ranged from stingray, butterfly ray, and whiting. At around 5:30 we were joined by a new friend named Ron. We had never fished before with Ron, nor had we even met him in person, but we had an awesome time with him. We tried to share some of our shark fishing knowledge with Ron and he shared some prime baits with us. He came equipped with some awesome shark gear and some great baits. He had a fresh southern ray that was about two and a half feet across and the biggest whiting I had ever seen (almost 20 inches). We tried our best that day, but didn’t even get one run. It wasn’t for a lack of effort either. The waves had picked up, so we were dealing with some of the roughest kayaking we had done yet. We had nothing to show for it though and sadly we weren’t able to put Ron on a big land based shark. We talked tom into putting on a Dinosaur hat we picked up at the dollar store earlier. He’ll probably kill me for posting this. We all had a great time though with some great friends, which is all that really matters. Sometimes the ocean gets the best of you. This summer has been hard fishing. We just haven’t been able to get the stars to line up for us. However, we still have been doing alright on the beach and hopefully we continue to catch fish. 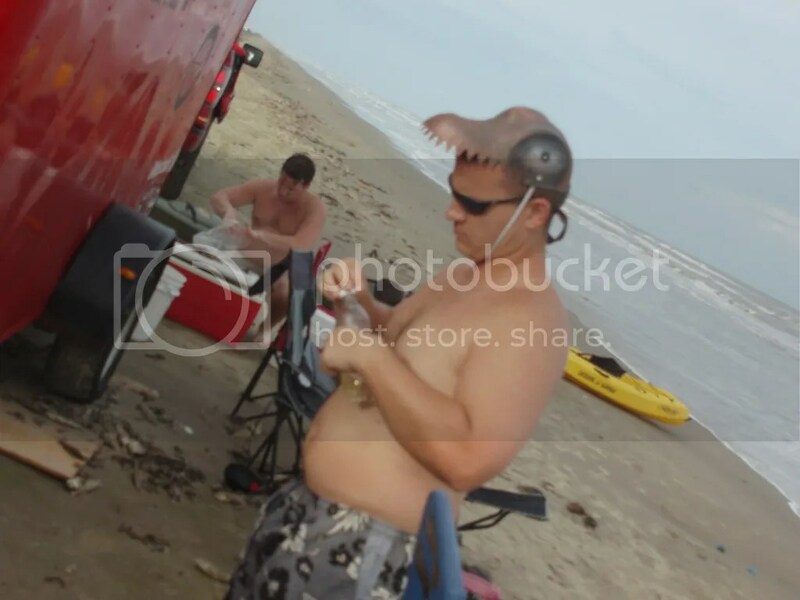 I was checking out pictures on the Texas Fishing Forum when I came across your post. I recognized the trailer set up from beach while the family was on vacation last week. Makes me think twice about letting my girls play in the surf! Thanks for checking out the page. 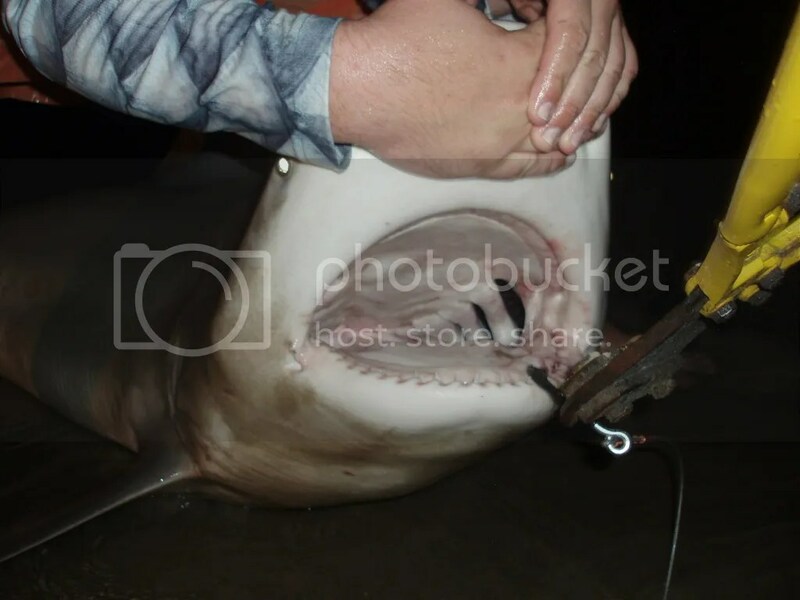 When I started shark fishing I was surprised at the size of sharks that swim around in waist to chest deep water never to be seen! The only thing that really scares me out there are the rip currents and the under tow. I’d rather swim surrounded by sharks than get caught up in one of those. I think you are talking about Vibrio. It is definitly something that I would not want to mess with. Fortunately, it is usually only an issue with people that have immune difiiciency problems already. Most people won’t be effected by Vibrio. It is still best to wash down cuts with Alcohol or Peroxide after being in the salt water.